Family owned and operated since 1944, Zinn Kitchens, Inc. is committed to creating beautiful custom cabinetry that fits your home and lifestyle. 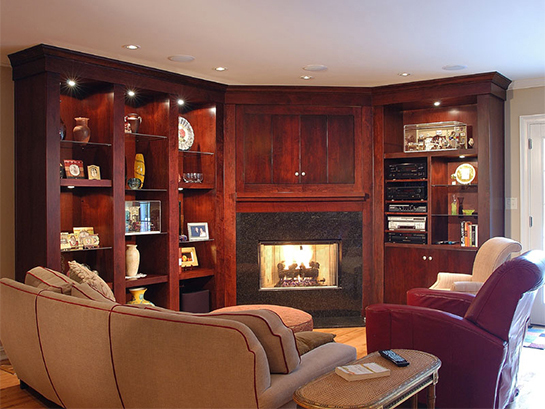 We manufacture our own all-wood line of custom cabinetry, which also features custom finishes. Offering cabinetry for every room of your home, we also carry a full line of name-brand appliances. Our showroom houses complete kitchen displays, along with bath vanities. Our full-time sales staff have many years of experience between them and are ready to offer their expertise in planning the cabinetry for your home. The heart of the home. This is where life happens and cabinets need to be at their best. Whether you’re hosting a party, or just watching tv, your entertainment space deserves functionality and appeal. Efficiency and Style can make all the difference in a Laundry room. Let us show you how to work around the washer and dryer and make it all work to your advantage. Whether it’s a gorgeous Master Bath or a functional guest/hall bath let us show you how we can help make these rooms look and work their best for you. "We absolutely love our new kitchen from Zinn’s! The craftsmanship of the cabinets and the expert installation are what set Zinn Kitchens apart from the others." Our people take great pride in what we do for our clients. From the first cut to the final top coat of finish we handle every step of the process with care and quality. Our overall process highlights our ability to work together as a team and provide seamless transitions between each department from start to finish. Ready to Start Your Custom Design?